Chinese President Xi Jinping spoke Monday at the opening of the Forum of China-Africa Cooperation. 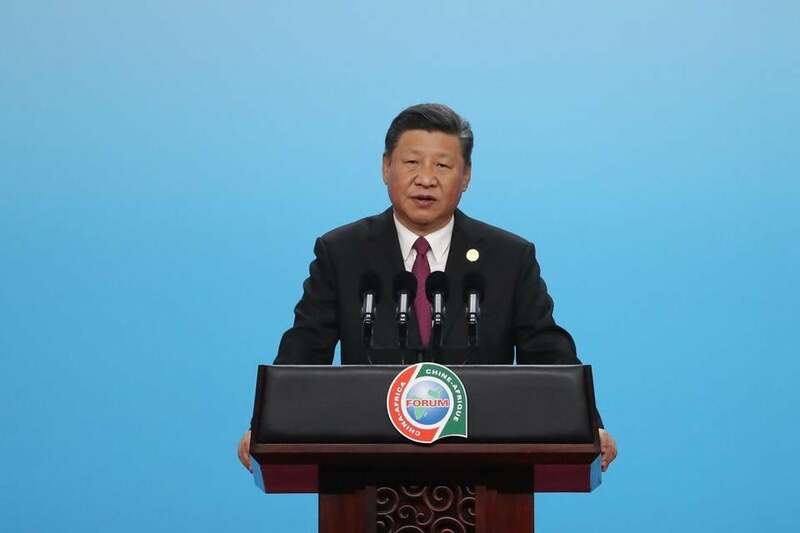 BEIJING — Chinese President Xi Jinping on Monday promoted Beijing’s initiative to build ports and other infrastructure to African leaders as a tool for ‘‘common prosperity’’ in a world facing challenges from trade protectionism. African and other Asian leaders have welcomed ‘‘Belt and Road’’ but some projects have prompted complaints about debt and other problems. The initiative involves hundreds of projects, most of them built by Chinese contractors and financed by loans from Chinese state-owned banks, across an arc of 65 countries from the South Pacific through Asia to Africa and the Middle East. The Forum on China-Africa Cooperation brings together leaders from China and more than 50 African countries. Dozens of African leaders met with Xi ahead of the conference. Xi made no mention of the political and debt concerns that overshadow some ‘‘Belt and Road’’ projects. But Chinese officials previously have rejected accusations that projects leave host countries too deeply indebted to Chinese lenders.